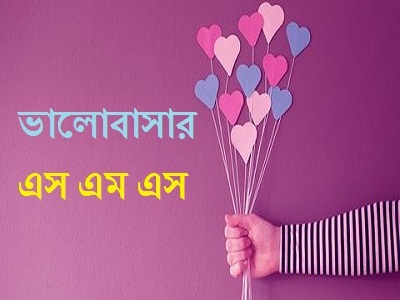 Valobashar sms bangla is most popular way to wish your girlfried or boyfriend. With valobashar sms bangl you can make happy to your lover. With this valobashar sms bangla you can get extra cradit from your lover. 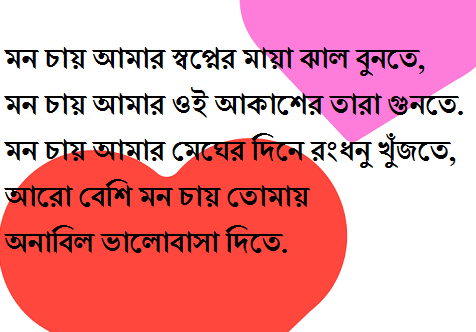 Though we get so many love sms but there is not enough valobashar sms bangla in the online or other place. These sms are mostly for romance and fun with loved one. 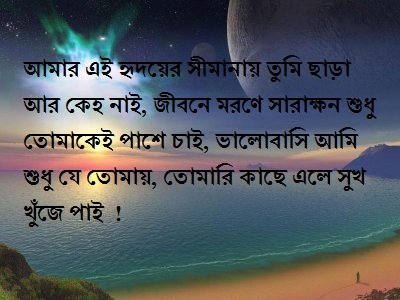 See more bangla love sms. Pakhi jodi ure jay take dhora jayna. ful jodi jhore jay take thik kora jayna. R manus jar preme pore take vula jayna. Mone Pore tomay ,vule Gechoki Aamay? Valobashi tomay, tumi Ki Basho Aamay? chai Sudhu tomay, tumi Ki Chao Aamay? amar Hridoye Sudhu tumi, tomar Hridoye Ki Achi Ami? Debo Tomay Lal Golap, Shopne Giye Korbo Alap. Bolbo Khule Moner Kotha, Ache Joto Dukkho Betha. Bolbo Tomay Valobashi, Thakbo Dujon Pasha-Pashi..!! Mon Diye Mon Neya Tar Nam Valobasha. Hridoy Diye Hridoy Neya Tar Nam Kache Asa. Asha Diye Puron Kora Tar Nam Vorosha. Kache Ese Abar Dure Jawa Tar Nam Ki Bolte paro ??? Abar Dukkho Bole Amar Bari Chol. Sei Sukheri Gaye Jeno tomar Namti Lekha..! 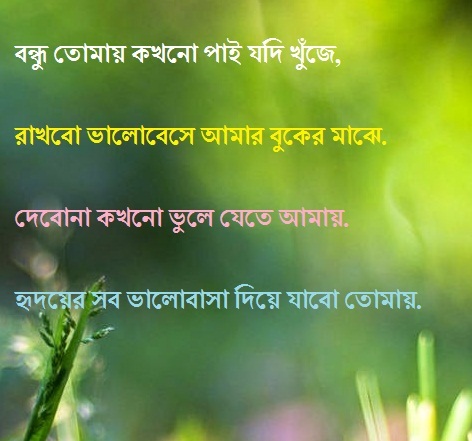 Sob shomoy Mone Korbo Sokal Bikal Sondha. Besi Na Amay tumi Ektu Valobasho. Lal Ful, pata Sobuj. Mon Keno Eto Obuj. Kotha kom, kaj Beshi. Mon Chay tomar Kache Ashi. Mon Bole Ami tomay Onek Bhalobashi. ek mutho Sukh- Ke Biliye Diye, jodi Bissash-Ke Rakte Paro. Tahole Setai Real Relation R Sottikarer Valobasha. Chokh Diye Buje Nio. Amar Cokher Kotha. Hridoy Diye Jene Niyo Amr Moner Betha. Apon Hoye Kache Theko. Dure Jeyona. Hotat Kore Vule Amay Dukkho Diona. Dure Gele Valobashar Moron Hobe Jani. Ami Basbo Valo Sudhu J tomay. 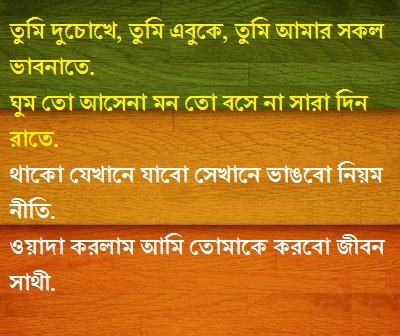 Tumi Ki Jano Akash Keno Kade , tomr Mon Kharap Bole,..
Tumi Ki Jano Ful Keno Fute, Tomake Debo Bole..
Nirobota Noy, Gobhiirota Ke Bissash Koro. Chokh Diye Noy, Mon Diye Tomar Priyo Jon Ke Valobasho. Asha Diye Noy, Valobasha Diye Valobasha Joy Koro. Kemone Je Bujhai Kotota Valobashi Tomake. Hoyto Tumi Sobi Bujho.